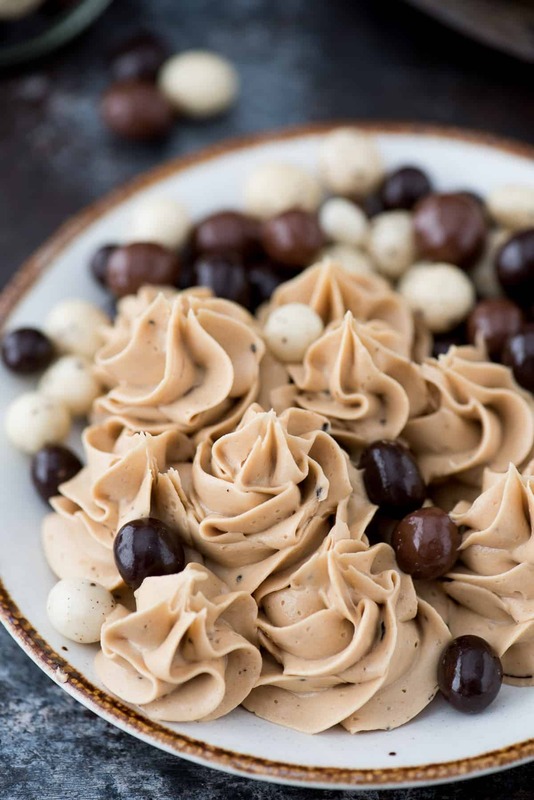 4 ingredient espresso buttercream recipe with instant coffee granules! This is now our go-to coffee frosting. 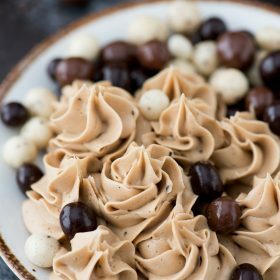 This coffee frosting is dreamy! ???? I will say this time and time again – my body cannot handle caffeine but I still LOVE the taste and smell of coffee. It’s a bummer that even decaf coffee can still affect me so I usually get my coffee fix through baked goods. Like espresso cheesecake, coffee whipped cream, espresso brownies. They are all good. And how did I forget about coffee ice cream?! That is probably where it all started. 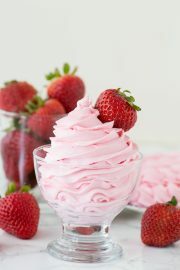 If you’re new to the world of buttercream, there’s actually different types – American, Swiss, Italian. American buttercream is the sweetest of them and consists of beating butter and powdered sugar together until you have a light, airy texture. Buttercream is just a fancy name for frosting. I use them interchangeably now, but before I was a blogger I never used the term buttercream. One of the easiest ways to make coffee buttercream is to use instant coffee granules. The granules will help give the frosting big espresso flavor without making it too liquid-y, unlike if you were to put actual brewed coffee into the frosting. I like to use decaf instant coffee granules, but you can use regular if you’d like. I also like that some of the granules don’t dissolve completely so the buttercream has flecks of coffee bits in it. 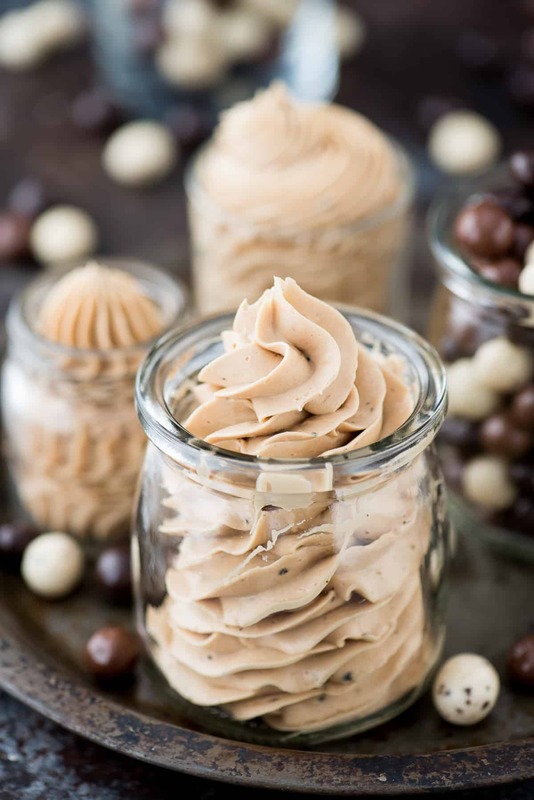 If you need a starting place for what to use this espresso buttercream with ??? ?2 layer espresso chocolate cake! You could just lick this frosting from a spoon, but here are some more idea! 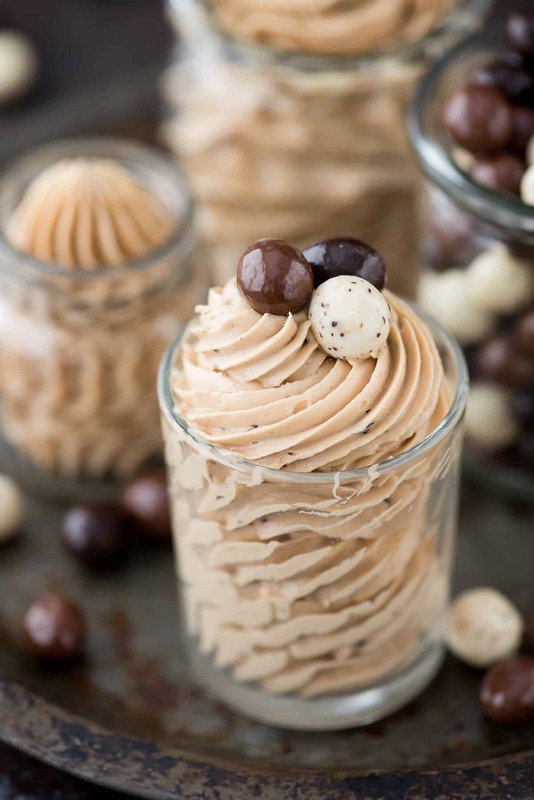 4 ingredient espresso buttercream recipe with uses instant coffee granules! 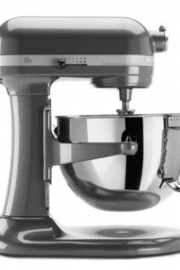 In a mixing bowl, combine the butter and vegetable shortening, beat using an electric mixer until fluffy, 1 minute. Add in the instant coffee granules that you dissolved in the milk. Add in additional instant coffee granules, about 1 tsp at a time until you get your desired coffee flavor. Begin to add the powdered sugar, about 1 cup at a time, mixing by hand first, then with the electric mixer. Continue adding powdered sugar until the frosting tastes good to you, is well mixed, and pipe-able. This recipe will make enough frosting to pipe 12 cupcakes. 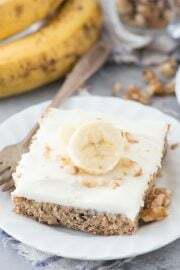 If you're wanting to cover a cake, double the recipe. My friends and I are doing cupcake wars at our school, we’ve already done the cupcake it self now we need the icing, were doing glow in the dark theme. 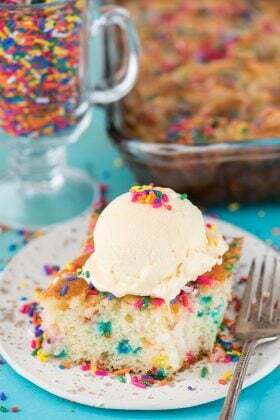 I want to know how to make a easy glow in the dark icing to make in 40 mins. Please and thank you! how much milk should you dissolve the coffee in? Is salted butter okay to use? Thank you! This was exactly what I was looking for! 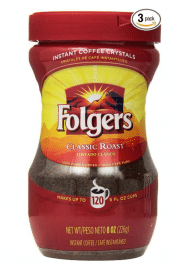 Can I replace instant coffee with ground up coffee beans? Does this need to be refrigerated? If so how long can it hold without refrigeration? Nope it doesn’t! It could sit out, covered, for a day or overnight. I’m planning to make this for a shower and want to do as much ahead prep as I can. Can I make it a few days before I pipe it out, or will it collapse? Can it get whipped back up? What’s the ideal for how soon you can make it before piping it? Best to make and pipe right away? Thanks! Hi Jenny! Buttercream can definitely be made 2-3 days ahead of time, covered and left on the counter! Just rewhip it before piping and it will be nice and smooth, not crusty!